It was hard not to get swept up in this one. Anyone who has frequented You Tube knows that certain posts go “viral”. Everyone gets caught up, there is a period of intense conversation and attention, and then it’s gone, replaced by the next trend. While I’ve been amused by some of these “current events”, I’ve never been an active participant. Until now. A few months ago, This is What We Look Like launched. The purpose: “Promoting the presence, awareness, and progress of women in traditionally male dominated fields – Filling the web with images of women doing what is usually considered men’s work”. Images of women wearing t-shirts with slogans such as “This is What a [Drummer/CEO/Philosopher/Surgeon] Looks Like” began to fill the internet. Next thing you know, the internet was flooded with surgeons posting pictures of themselves, tagged with #ILookLikeASurgeon. All taking part in the celebration of surgical diversity. Medical student Jasmine Miller put together a Storify of the images, and a Facebook page was started by surgeon Dr. Kathy Hughes, who blogs at Behind the Mask. The images are inspiring. Women from all over the world have participated. Men have joined in, “celebrating the diversity of surgeons and surgery itself” as tweeted by Dr. Niraj Gusani. Dr. Chris Porter wrote about the challenges of a surgical career as a single parent. Breast cancer patient Terri Coutee wrote about how the images humanized the profession. Even the TODAY Show took notice. It is unfortunate that campaigns like this are still necessary. During many of my medical school interviews, I was asked “How can you think about becoming a doctor when you are going to have children?”. Never mind that I didn’t see children in my future even at that young age. On one of my interviews for general surgery residency, I was told by a senior surgeon that women were not generally welcome in the operating rooms at that institution – how would I handle that? I handled it by finishing that interview and skipping out on the lunch and afternoon program to catch an earlier flight home. My medical school class at Georgetown was about 40% women. However, as a general surgery intern at Georgetown in 1990, I was the only woman in the 5-year surgical residency program. There was only one female faculty member, Dr. Colette Magnant. I was one of only a few woman to finish the program as a general surgeon. However, I was supported throughout my residency training, and never felt that my gender was a barrier. Throughout my career, I have been mentored by incredible women and men. I owe the many women who came before me in medicine an enormous debt of gratitude, as I feel I’ve had a relatively easy time of things. One of my great pleasures today is working with young women including high school and college students, medical students and surgical trainees, to help show them that “it can be done”. There are now a growing number of role models for women considering a surgical career. More and more women are filling department chair positions at academic and community institutions and are taking on leadership roles in professional organizations. I am proud to be serving as the current President of the American Society of Breast Surgeons and was happy to respond “no!” when asked if I was their first female president. I am the 19th President, and the 6th woman to hold that position. 52% of our members are women, and 56% of our leadership roles are filled by women, a point raised by Dr. Hiram Cody III during his Presidential Address in April 2015. 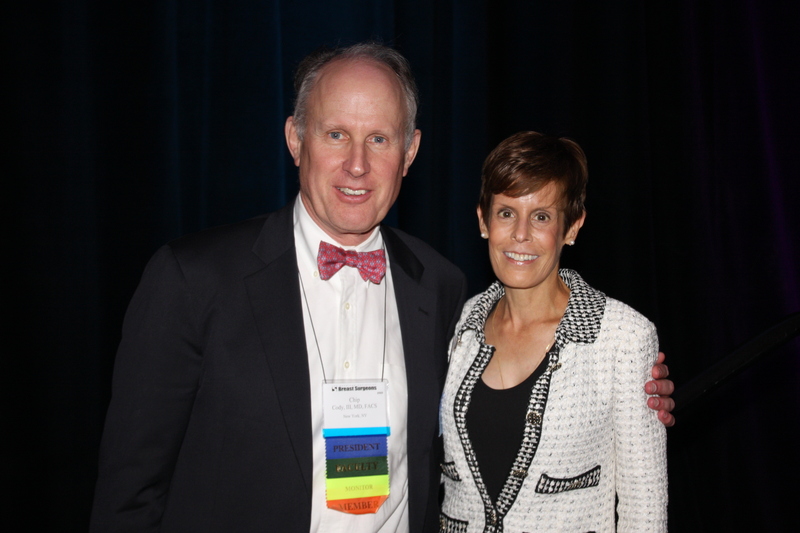 In Dr. Cody’s words: “We are not an old boy’s club, and there is no glass ceiling at ASBrS”. Women in surgery and other fields still face many challenges. But the #ILookLikeASurgeon campaign reminds us how many have successfully faced those challenges. My hope is that there will be no need for similar campaigns in the future. This entry was posted in Breast Surgeon, Motivation, Social Media and tagged #ILookLikeASurgeon, women surgeons by DrAttai. Bookmark the permalink. Great post and great campaign! I helped promote the #ILookLikeAnEngineer campaign in my day job and it’s even more fitting here. I haven’t done the math but I’m sure there are way more female engineers than surgeons. What’s great about both is we’re showing the next generation what’s possible. I look forward to when we won’t need these hashtags.